Rebecca Solnit is a writer, historian, and activist. A long-time resident of San Francisco, she has written on geography, community, the environment, art, politics, hope, and feminism in her seventeen books including Infinite City: A San Francisco Atlas, Unfathomable City: A New Orleans Atlas, and 2016’s Nonstop Metropolis: A New York City Atlas, River of Shadows, Men Explain Things to Me, A Field Guide to Getting Lost, and Hollow City: The Siege of San Francisco and the Crisis of American Urbanism. A product of the California public education system from kindergarten to graduate school and frequent contributor to the political site Tomdispatch.com, Solnit is a contributing editor to Harper’s, where she is the first woman to regularly write the Easy Chair column (founded in 1851). Roshi Joan Halifax is a Buddhist teacher, Zen priest, anthropologist, and pioneer in the field of end-of-life care. 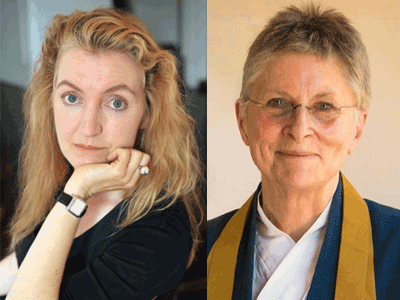 She is Founder, Abbot, and Head Teacher of Upaya Institute and Zen Center in Santa Fe, New Mexico. She received her Ph.D. in medical anthropology in 1973 and has lectured on the subject of death and dying at many academic institutions and medical centers around the world. She received a National Science Foundation Fellowship in Visual Anthropology, was an Honorary Research Fellow in Medical Ethnobotany at Harvard University, and was a Distinguished Visiting Scholar at the Library of Congress.